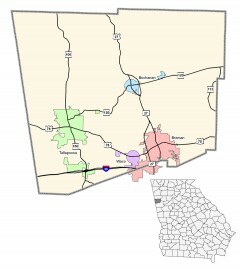 Haralson County was created in 1856 from parts of Carroll and Polk counties. Georgia’s 112th county was named for General Hugh A. Haralson, a U.S. Congressman and an officer in the state militia. The old county courthouse, built in 1891 and now home of the local historical society, is a prime example of a public building constructed in the Queen Anne style. The clock tower was added in 1897. Tallapoosa, the “Dogwood City,” was named for the river that runs through Haralson County. Tallapoosa is an Indian word meaning “Golden Water.” Tallapoosa is also known for having opened the first free school in Georgia in 1889.